There used to be an advertising slogan in the UK ‘drinka-pinta-milka-day’… being lactose intolerant rather puts the kibosh on this, but currently I am picking a pint of raspberries every day. 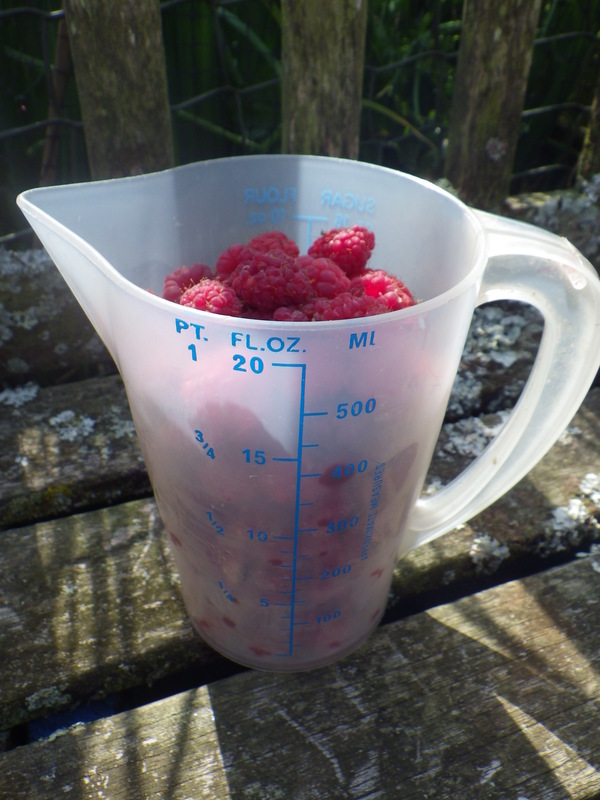 It’s turning out to be a very good year for berries, so each day I go out to the garden with a plastic pint jug (that’s a UK pint, so 20 fluid ounces) and fill it with raspberries. Once it’s full, I come back in and don’t pick any more – it’s enough. Every day I have raspberries for breakfast with my homemade yoghurt and homemade granola… what a joy, especially if they are just picked, still sun-warmed from the garden. The remainder are being put into the freezer for a delicious taste of summer in the winter. 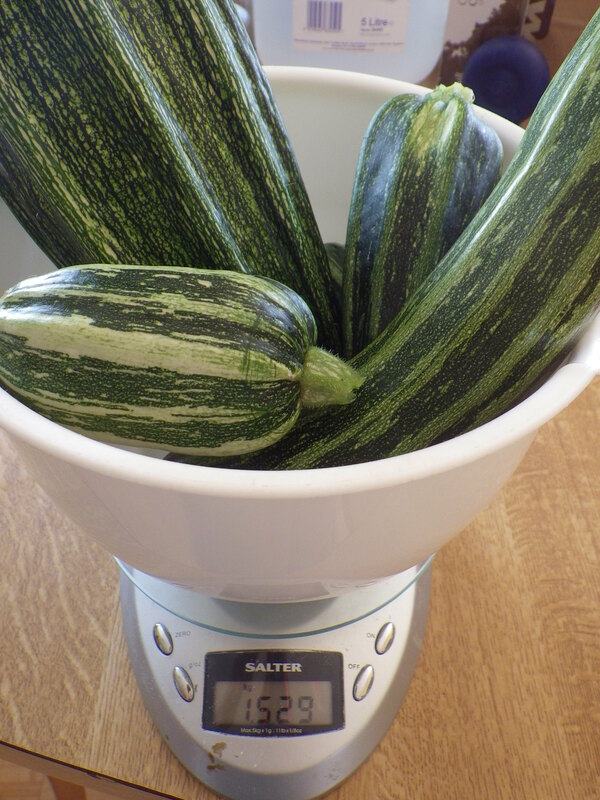 And raspberries are not the only abundant thing in the garden… the courgettes (zucchini) are prolific. I picked a kilo and a half yesterday, despite the fact that the day before I had turned a kilo of the things into soup. I probably shouldn’t have planted six plants, but that’s what I’ve got! It’s quite early for a glut, but the weather here in June was so good that the plants have just romped away. Never fear, though, they do not go to waste. Apart from soup and courgettes fried in olive oil with garlic, we will be enjoying courgette moussaka (replace the aubergine with courgette), courgette risotto, roasted vegetable sauce… just not courgette cake – Mr Snail will not eat any sort of cake containing vegetables! What we don’t eat straight away will be turned into either soup or simply roasted in chunks and frozen. I love to have a freezer full of soup for use in the less abundant months – it’s so good to be able to defrost a block for lunch on a chilly day. So much nicer than opening a tin and I know what all the ingredients are. On the horizon are runner beans, mange tout and shallots. All of these are grown without the aid of chemicals and from traditional seed varieties. I just want to remind you, though, that my vegetable patch consists of an area measuring 4m × 6m, with an additional 2.5m ×1m plus some pots and a 1.9m × 2.2m greenhouse, then I have 3m × 4m for fruit and herbs. So, it is possible to grow a significant amount of your own food in a really small space… you don’t need a farm. And all these crops help me control what I’m eating and cut down on food miles, to say nothing of making me feel a connection between my food and the seasons, the soil and the sunshine. Courgette (Zucchini) crisps (chips) is another good way to use them up: Slice thinly on the diagonal to make a decent sized chip, sprinkle lightly with salt and a little finely grated Parmesan, roast in the oven on a low heat till crispy…. I’m intrigued – do you use a plant milk for your yoghurt? And if so, how do you make it? I am able to eat live yoghurt because the Lactobacillus pre-digest the lactose for me. I sometimes make use of lactase enzyme tablets so that I can eat dairy, but generally I stick to live yoghurt as a source of calcium. Interestingly, some hard cheeses are ok too because lactose is water soluble and so squeezing the liquid out during the cheese pressing removes much of the lactose. Still waiting on summer squash here, as I was building beds when I ought to have been planting (smile). Have to hope I get a few fruit before the squash vine borers take them out. But today I picked three cups of wild blackberries (probably Rubus fruticosus)! Lucky you! The raspberries are growing like mad down the lane across from our house, but God forbid they grow in our garden. We have magpies that seem to watch our berry plants – the blackcurrant tree in particular – who wait for the specific moment the berries ripen and by the time we notice, there’s maybe a handful left if we’re lucky. I know that feeling – we invested in a fruit cage a few years back and I has been amazing… without it I doubt we would ever harvest even a single raspberry!